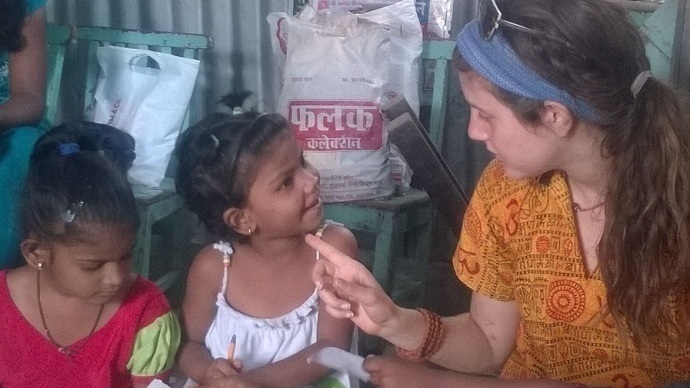 Gabriel Project Mumbai brings young Jewish adults to India to help break the cycle of poverty and hunger by volunteering in food distribution and literacy among the children of the Mumbai slums. Mumbai is home to 22 million people, and over 70% live in slums with limited access to electricity, clean water, food, and educational opportunities. Children’s basic education is often put off as parents struggle to balance the immediate needs for family survival over the need of a child to grow, develop, and study. The mission of Gabriel Project Mumbai is to create a center of food distribution and literacy empowerment for the children of the Mumbai slums that is run by young Jewish adult volunteers on a semester-long program of learning and working in Mumbai. The program, which is in collaboration with local NGO's providing education in the slums, brings Jewish young adults to Mumbai for a semester. They help local women's groups (sponsored by a GPM micro-financing arrangement) prepare and deliver a daily warm meal for schoolchildren, ages 4-12, thus creating powerful incentives for parents to send their children to learn rather than to work in the streets. Volunteers also deliver basic literacy by interacting with the children, teaching them English through interaction and immersion. All the while, the volunteers live in a kosher, Jewish environment where they learn about Indian culture, the history of Jews in India and Jewish ethics of social justice and Tikkun Olam. It is a vision for changing the lives of slum children while educating young Jewish adults in the powerful ethos of care.